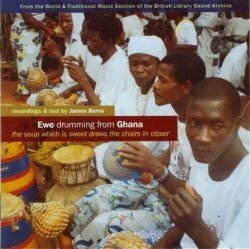 Afa; Akpoka; Ageshe; Kinka; Agogbagba; Xomeshivi / Adzotsotso / Mia woezo; Dzigbordi Dance Drumming; Dzigbordi Dtince Drumming; Dzigbordi Dance Drumming; Dzigbordi Dance Drumming: Women's a cappella song. 63 minutes. This is a set of field recordings, made outdoors in the Ewe town of Dzodze on 8 August 2002, 9 April 2003 and 14 April 2003 by James Burns. Burns recently completed his PhD at SOAS, University of London, and is now teaching at the State University of New York at Binghamton. He provides careful annotations, detailing the solo singers, the chorus members, and all the drummers, together with the drums they play  atsimevu, asivui, gboba, and kegen. This album celebrates a community group, the Dzigbordi group; it was overseen by group officials (chairman, vice-chairman, organizer, secretaries) from the Tagborio family, and everything has been beautifully recorded (and is beautifully reproduced on the CD) on a Sony DAT machine with a pair of Sonic Studios microphones. In other words, and as we would expect from a careful scholar who is passionate about this music, Burns has taken great care in bringing these recordings to us. The notes are expansive, running to 24 pages and including backgrounds and descriptions to each song, photographs, texts, and a number of notations of rhythm; special script characters are used and explained so that we can faithfully reproduce names and terms. The recording forms one of the expanding and always excellent releases from the World and Traditional Section of the British Library Sound Archive, overseen by Janet Topp Fargion. 'Ewe drumming' really gives just half the picture: most tracks have vocal parts that are typically antiphonal, modelled around a call and response alternation. Dzodze is a community in the extreme southeast of Ghana; these musicians speak one language within the Gbe cluster of Kwa languages within the Niger-Congo family, sharing affinities with ethnic groups who spread eastwards through Togo to southern Benin. The subtitle to the album refers to a soup made from okra, found throughout the region but in each area differentiated by its unique combination of spices. The soup links to a proverb that has it the sweeter the taste the more it pulls in spectators (the chairs). This gives a link to music, where like the okra soup there is a musical matrix of instruments, rhythms, dances, and melodies that create a specific and discernable identity. Nonetheless, a number of the tracks are known throughout the region, and form an ancient tradition continued into the present day (tracks 1, 2 and 5). Historicity is confirmed by linking family members back to Togbui Avoklia, who lived some 300 years ago. And, although the recording is dedicated to the memory of three local performers, it also forms the last recording involving the senior clan member Mishhiso Tagborio, in his nineties when recorded, who died at roughly the same time as this Topic album was released. Within the antiphonal structure, the song leader is known as the heno or hesino, and fits his or her song precisely within the rhythmic structure. There may be more than one leader, and the chorus provides a response, again, with senior members ensuring that everything fits into the ongoing rhythmic cycle. The strict time frame that sits behind everything is maintained and expanded by a mix of two types of percussion: drums and hand percussion. Burns relates how the drums produce the equivalent of an orchestra, creating a melody with pitches coming from the tunings of the individual drums, the drums hocketing and mixing together in a way that seems to amplify and enlarge the total sound. These are coupled to a shaker made from a gourd (the axatse) and a double iron bell, with the two bells of different pitch welded together (the gankogui). The driving rhythms give one of the essential characteristics, with the iron bells holding the pieces together through a repeating time-line, much as the claves do across in the Caribbean. The album is put together to sound like a seamless performance. The first five tracks, we are told, normally form an introduction to the whole of a performance, and are a set of dances. Track 6 is a special act that begins the musical performance per se, in which several members of the group hide, as 'lost children', in a room of the houses making up the borders of the performance area, gradually re-entering the group's dance circle. Then come four dance drumming tracks, and finally an unaccompanied song lamenting the difficulties of life. This is given by some of the group's women. Burns tells us that he first heard this song sung late at night after one of the group's officers had died in a bicycle accident. He was moved, and later asked them to record it. For driving rhythms, the rhythms kept together by the familiar two-pitches of the iron bells, and for the communal singing, this makes for good listening. Everything is crisp and clear, the general noise level taking out any noticeable background noise. And, because of the comprehensive notes, written by someone clearly deeply involved with and respectful of the Dzodze community, the album allows us to come close to these singers and drummers of a distant land.